Read Color, Ruth Heller. There's a clear and colorful explanation of printing using four colors: Yellow, cyan, magenta and black. Or find another simple explanation to read (like this one, The Science of Light: Made from Dots). Dotty Dots: You need a pencil, a piece of white paper, a yellow marker, a red marker, and a blue marker (preferably a cyan blue rather than a royal blue). Draw three circles with a gray pencil on the white piece of paper. In one circle, use the red and blue marker tips to make red dots and blue dots, as close together as you can get without overlapping. In another circle, do the same with the blue and the yellow markers, and use red and yellow dots to fill in the third circle. Look at the circles close up--can you see the separate colors? Now ask another person to hold up your paper as you look at it from across the room. Can you still see separate dots of different colors, or do they blend to look like one color? 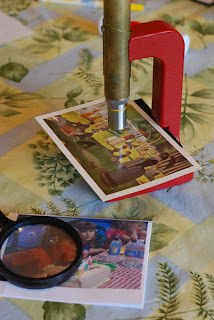 Colors under the microscope: Look at a variety of pictures--photographs, postcards, books--with a magnifying glass and under the microscope. 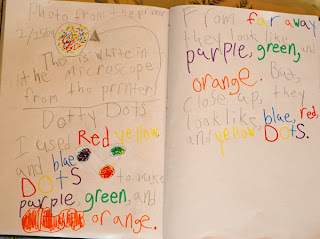 Do you see tiny dots used to make the rainbow of colors? Now look at a part of a printed photo or postcard that looks white. What do you see under the microscope? 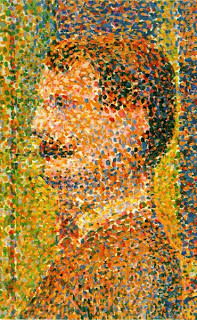 Bonus Lesson: Read about Georges Seurat. His art was influenced by the science of color. Look closely at his pictures, and you'll see that they're composed of tiny dots of pure color. Growing Vegetables West of the Cascades: The Complete Guide to Organic Gardening, Steve Solomon. It's garden season. Last week I got out and started digging up my garden boxes. It's time to plant peas, and soon I'll be planting spinach and potatoes. Growing Vegetables West of the Cascades is my new garden bible because it's written specifically for this wet temperate region. In other vegetable news, I called the Food for Lane County Youth Farm to sign up for a CSA box again this year. I can't wait! Knowing and Teaching Elementary Mathematics: Teachers' Understanding of Fundamental Mathematics in China and the United States (Studies in Mathematical Thinking and Learning. ), Liping Ma. "Mathematical knowledge is based on both convention and logic. However, convention...serves as a shelter for those who don't have a conceptual understanding of a mathematical procedure." (p. 31) Knowing and Teaching Elementary Mathematics was mentioned on a homeschool message board, and it's not available at our library, so I bought it. So far it's fascinating. This book is worth a separate post of its own. I hope to get to that soon. A Collection of Math Lessons, Grades 1-3 (Math Solutions Series), Marilyn Burns and Bonnie Tank. A Collection of Math Lessons showed up while I was looking on Amazon.com for the Liping Ma book, and this book is available from the library. 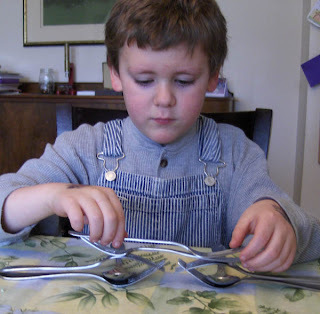 It's got hands-on activties designed to stimulate mathematical creativity and problem-solving. The fine young gents and I have done the first math lesson, math necklaces, and it was great fun all around. Also worthy of a separate post. Mary Poppins, P. L. Travers. I finished Mary Poppins last night. We were all a little sad. The fine young gents were charmed by the Banks children and their magical adventures with Mary. Second-grade gent's favorite chapter was the visit to the zoo, kindergarten gent still asks questions about Michael's bad day, and preschool gent wants me to re-read the visit to Uncle Wigg who went rolling and bobbing about the ceiling. As for me, well, I found myself delightedly exclaiming as I started each new chapter, "Oh, this is one of my favorite chapters in any book, ever!" The Magic Pocket: Selected Poems, Michio Mado, Anno Mitsumasa, and Empress Michiko. The Magic Pocket is lovely Japanese poems translated into English. The orginal Japanese is printed on the facing page. The elder lovely lady is teaching her brothers Japanese, so I keep my eye out for library books that they might enjoy. She's been reading some of these lovely poems in English to the fine young gents, and in Japanese to herself, delighted that she can read them in their orginal versions. Wag a Tail, Lois Ehlert. Lois Ehlert is a favorite of the fine young gents. Our youngest gent has had this on the shelf by his bed for a couple weeks now, and he's fascinated by the dogs and their adventures. Planting a Rainbow, Lois Ehlert. Gardening and colors. A perfect companion to our soon-to-be-spring studies. The illustrations, of a garden planted in a rainbow of flowers, are bold and simple, beautiful and accurate. Is It Red? Is It Yellow? 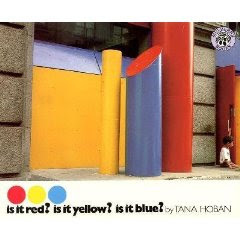 Is It Blue?, Tana Hoban. There are no words in this book, just color circles at the bottom of each page of the brightly colored photos of a city. I checked this out from the library to go with our color studies, and the fine young gents keep pulling it off the shelf and poring over the pictures. It's bright, colorful and engaging, perfect for all ages. Divide and Ride (MathStart 3), Stuart J. Murphy and George Ulrich. 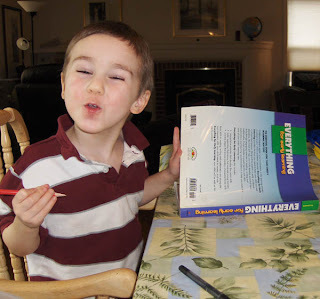 These MathStart books are a fun way to introduce and reinforce math concepts. One of the gents chose this book at the library, and it's been floating around the house ever since. With no prompting from me, I might add. They've got fine math minds and they think it's fun. I still scratch my head about that one. 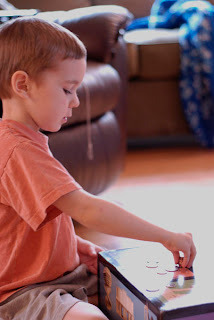 How is it that my children love math? Actually, I don't scratch my head, I think I know why. But that's another post too. Harry Potter and the Goblet of Fire, J. K. Rowling. Second-grade gent has decided he's ready to tackle number four. He read the second and third books in the Harry Potter series last year, then decided to take a break because they were getting scary and longer. Two weeks ago, he mentioned that he might like to read The Goblet of Fire, so I made him a deal: Not only will he get to watch the movie after he reads the book, I'll read the fifth book as a read-aloud once he's finished the fourth. Last week we had a Potter-a-thon and watched the first three movies, and yesterday he started Harry Potter and the Goblet of Fire. He's already captivated. 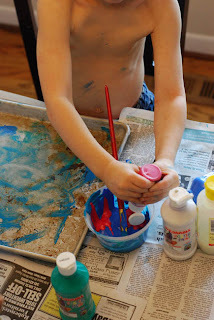 It's Levi, mixing paint in a dish. We made prints on paper. This picture is even in the linked post. Not very exciting. 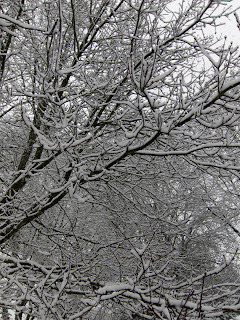 Snow in the back yard trees. In this rainy, fairly temperate climate, waking up to snow is like waking up to find that it's Christmas, except snow is a surprise. The whole neighborhood looks like a new place, and everything here shuts down so it's quiet and still. I wrote a post about this snow, and the above picture is in that post. Hmm. Looks like you're not getting a new picture today after all. But it's still lovely to revisit that day. Now I have to tag six people. This is a simple one, ladies, so please play with me! When did we outgrow the word "barf"? It sounds just like what it is. A loud, round, rough word, a vivid verb, the epitome of onomatopoeia. Instead we use the pale and sickly "vomit" or the bland "threw up" or "puke"--such a wimpy word. From now on, I'm going to say "barf." Barf, barf, barf. Today, I'll be saying "epitome of onomatopoeia" all day long. Try it! It's delicious. 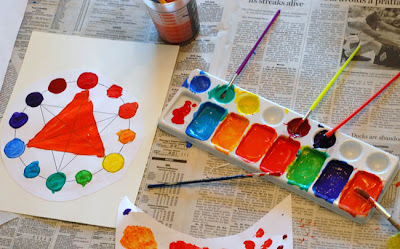 Last week, we started our color study with an art project as basic as you can get: Think of something brightly colored. Choose colors from the crayon box and draw it. We have two beautiful drawings of rainbows and a paper with circles and L-E-V-I written all over hanging on the fridge. We read about wavelengths of light in The Visual Encyclopedia of Science (DK). Next, a color wheel study. 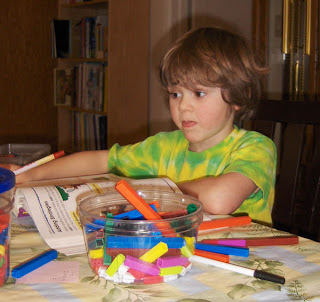 Kid Zone Science has some nice material, including The Color Wheel, a colorful explanation of primary and secondary colors and a color wheel worksheet. 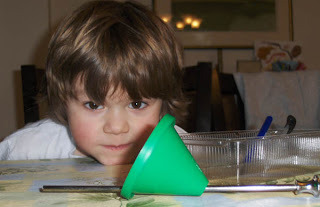 You need a coffee filter, markers, an eyedropper and water. A paper plate, thick paper towel, or baking sheet is nice too, as it keeps the inks from bleeding onto your work surface. Color large dots or thick lines of single colors on your coffee filter. Drop water on the ink dots with the eyedropper. It's fun to watch the colors wick across the filter, so take some time to observe. Set aside the filter to dry. Once it's dry, observe what's happened to the colors, especially at the edges. 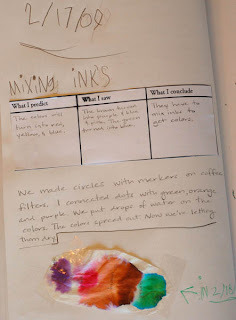 We discovered that our colored inks separated into different colors. We used Crayola markers and they worked dandy. 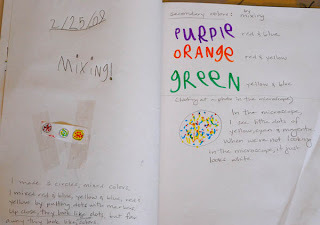 The best color markers for the experiment: Brown, which separated into orange-pink-purple-blue, and green, which spread into a vivid blue edged with the faintest line of yellow. The fine young gents recorded the results in their science notebooks using this form. It's a great all-purpose science form for young students. 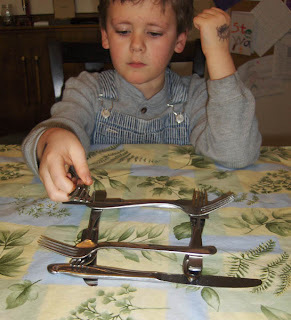 Students to make a prediction, observe, and come to a conclusion based on the observation, which, when you think about it, is the nuts and bolts of a science experiment. A color study lends itself to a blending of art and science, and since we had all of the materials on the table we ended with coffee filter butterflies. 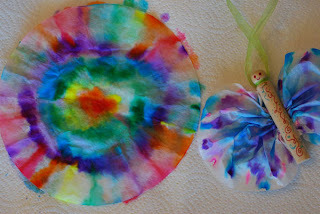 Color with marker on a coffee filter. Use lots of bright colors! 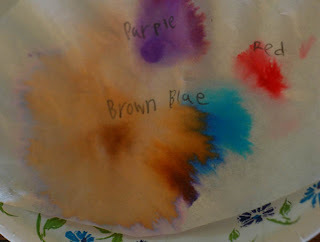 Drop water droplets onto the colors with the eyedropper and set aside the coffee filter to dry. Once the coffee filter is dry, scrunch the filter into a decorated doll clothespin. Add pipe cleaner antennae or tie a ribbon around the top to hang your butterfly. Create a rainbow with the prism we've got stashed around here somewhere, and maybe with the hose too if we get a day that's sunny and warm enough. “Apparently the BBC reckons most people will have read only 6 of the 100 books here.” Some of the list seems to come from the BBC’s Big Read list of 100 favorite books in Britain, although not completely and not in entirely the same order. The eggs were supposed to be pink. We have eggs for breakfast almost every day, and I wanted them to be special for our Valentine's Day breakfast, so I decided to try strawberry eggs. I set aside some strawberry juice from the last of the strawberries we picked last summer. I scrambled the eggs with just a little sugar. Then I realized I'd need the strawberry juice for the pink whipped cream, so I decided to use the strawberry-blueberry puree to flavor the eggs. What color do you get when you mix Red+Blue+Yellow? Think! Challenge, Week 24: Trash. Without clues about the project, choose five pieces of trash out of the trash can. 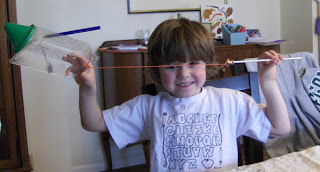 Using those five pieces, along with scissors, tape and string, build a fish that will float. Our trash can is filled with pencil shavings, floor sweepings and used tissues. Ew. So I saved the "good" trash for a couple days, and pulled everything out of the recycle bin except for the paper scraps, and asked the fine young gents to choose their items from that pile. 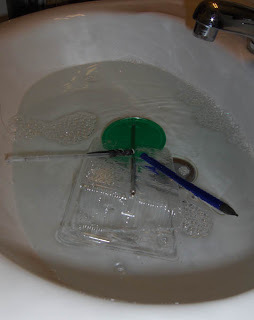 Tolly started with a plastic tray from a package of cookies, two pieces of of a mechanical pencil, a cone-shaped plastic drink lid and a metal rod. He said, "I don't know how to make a fish!" Which is the point. How does one make a fish with such odd materials? His older brother, always ready to tell others what to do and how to do it, picked up the cookie tray and said, "This is the body." I shooshed him and shooed him back to his own fish. But he was right. Of all the materials, the cookie tray was probably the best candidate for a fish body. 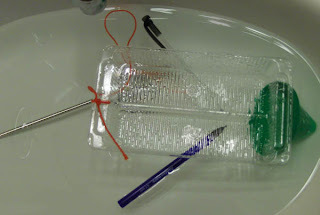 Tolly saw immediately that he had a head (plastic lid), two fins (pencil pieces) and that if he slid the rod through the lid, he could fasten the head onto the fish by fitting the rod neatly into the groove in the tray and taping it in place. He taped on the pencil fins too, and off we went to the bathroom sink. It didn't float. 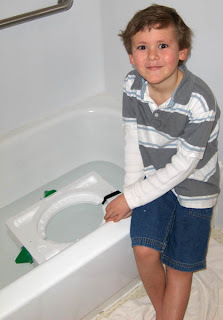 I prepped him ahead of time: "What will we do if it doesn't float? If it doesn't work the first time, remember to look for the parts that sink so that you can redesign your fish." At first he filled the sink with more water, to see if that was the problem. It wasn't. So, back to the drawing board. He decided his fish needed an anchor to keep it from floating away. It worked! Actually it sank again, but he turned his fish over so that the tray floated like a boat. Success! He's very excited about his fish. It's still floating in the bathroom sink. He ended up changing materials halfway through because his paint card ripped and the other styrofoam block was too big. He traded for two more plastic lids, leaving him with the large styrofoam block, three lids (a mouth and two fins) and the elastic band, which he strapped onto the back of his fish to make a tail. It floated, even with holes, and he's been playing with it in the bathtub this afternoon, transforming it into a droid boat or some such. Think! 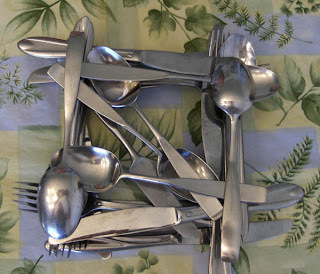 challenge, Week 23: Slippery Silverware. 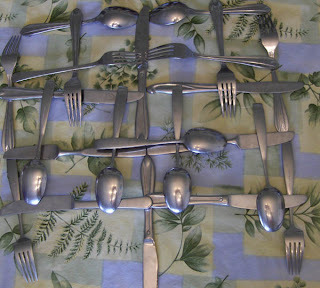 Make a tower as tall as possible using 8 forks, 8 knives and 8 spoons. And making silly faces at Mom. 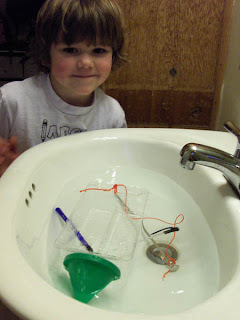 Today, we created floating fish out of trash, for Think!, Week 24. Pictures and more to come. Imagine my confusion when the eldest fine young gent announced on the way to piano lesson, "When we grow up, we're going to be minors." "We're going to get jewels and stuff out of the earth." They've got a plan. They'll live in a cabin on a mountain and mine. They'll sell all of their diamonds and jewels to get money, and the gold they'll sell for free to the poor people. Then when they run out of money, they'll just go back to their mine and get more jewels. They won't give any money to the rich people, because the rich people are greedy and bad and only want more money. This is the point where I finally stepped in, a bit gingerly: "Are all rich people greedy, do you think? If it's not fair to think badly of someone who has no money, maybe it's not fair to think badly of someone with lots of money. What if we just judge if people are greedy and bad if they act greedy and bad?" Silence. Well, crumb, I think. I killed the dream. Then, "Oh. Well, maybe we could give the money to the good rich people so that they can share and help the poor people too, and then they can be good." Which led to a discussion that filled the rest of the journey to piano and afterward too, about resources and charitable foundations and sharing, and how we're rich in comparison to most of the world, and our favorite gems. I know they'll figure out soon enough that it's not that easy, that fabulous fairy-tale caves filled with jewels and heaps of gold don't really exist on this earth. For now I'm just charmed that the plan is to keep some and share some. That's a worthy plan for the future. Think! challenge, Week 22: Clever Coin Stacking. 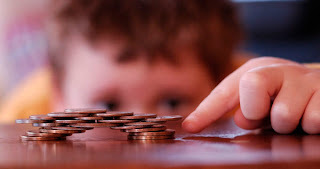 Using 100 coins, build the widest possible structure that stands at least 1 inch tall, with as few coins as possible touching the table. "I have to use all of the coins?" In a dismayed voice. Yes, darling, that's the challenge. 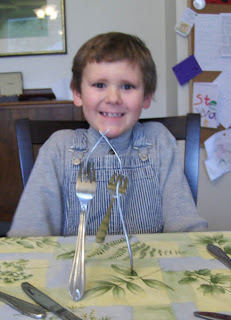 For this fine young gent, part of the challenge is thinking-through. He's a bright guy. Answers to problems often just pop into his head. The value of the Think! challenges for this young man is just as much in learning persistence and the value of making mistakes, in not finding the right answer immediately. Creative thinking isn't only flashes of brilliance, it's experimenting to find out what doesn't work and why so that one can try, try again. At least that's what I tell him. You can see the point in his structure where he gave up on the "as few coins as possible touching the table" part. He got frustrated when his widening structure kept on collapsing, so he built more pillars. And that's okay, it's his structure. I encouraged and made suggestions during the building, and we discussed following the guidelines for the challenge afterward. Here lies my ongoing Think! challenge: To encourage the fine young gents to persist and to follow the directions without killing the creativity or the fun. How do I help them to persist in the face of frustration, to look for solutions without leading them to my answers, help them to follow the rules without feeling constrained by them? The younger gents chose not to participate in the challenge. But they still enjoy the Think! 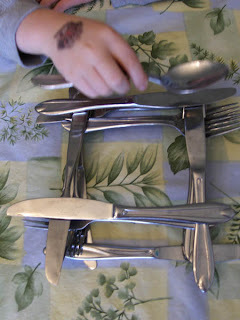 challenges, because they're given materials for building or creating that they might not have thought of on their own. Kindergarten gent started by building a tall tower of pennies, then got sidetracked by sorting and counting the coins. 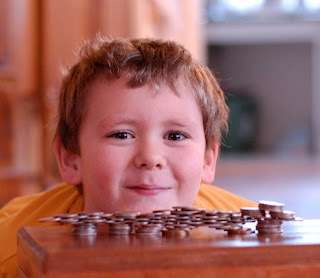 While his brother built a coin bridge, I played a coin counting game with this fine young gent: Can you find three coins that add to thirty-six cents? How many different ways can you make forty cents? The youngest gent just wanted to stack coins and knock them over. 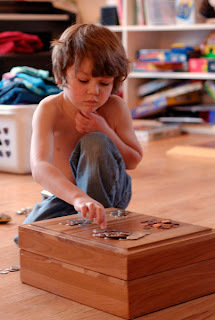 He played with the coins for quite a time after his brothers had returned to their regular schoolwork. For this fine young gentleman, one of my favorite things about the Think! 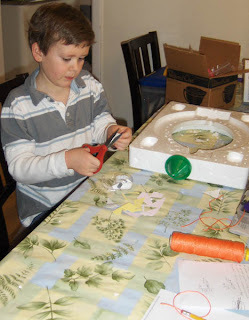 challenges is that the unusual materials keep him happily occupied and challenge him to experiment with new materials. We can't wait to try this one! Last night we went to Splash!. It's this really cool swim center with a play pool, a water slide, a lap pool, a warm kiddie pool, and a pool with rolling waves. We had a blast splashing and sliding and swimming and riding the inner tubes. 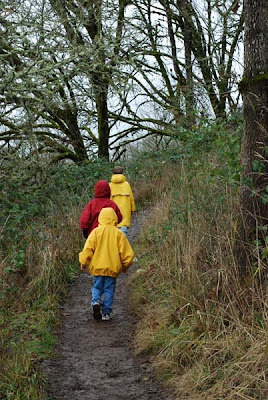 I turned from giving middle gent a five-minutes-until-we-leave warning to see loving husband waving and pointing, and eight-year-old gent walking toward me crying and dripping blood from his chin. 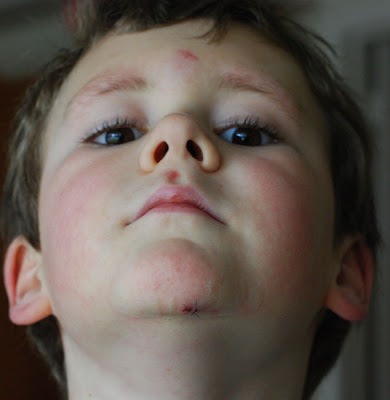 He'd been falling off his inner tube on purpose, got pushed down by a wave and landed hard at the bottom of the pool, right on his chin. This after having dived too deep under a wave and landing on his nose at the beginning of the swim, then landing on his forehead mid-way through the session leaving him with a scrape and small cut. He's not a reckless guy, but he loves to swim and he plays hard. Back to the cut on the chin. It figures: He fell right after both the urgent care and the after-hours clinic closed, on a weekend when our ER-doc neighbor is out of town. Just like his brother two years ago. Doctor Mom waffled. It's on his face, but not bleeding much. It's deeper than a scratch, but not very big. Didn't hurt much at all. I called the on-call nurse. Like that's going to be any help. She can't see it. She recommended having it looked at because it's on his face. The deciding factor was the shape. If it had been a straight cut, I'd have slathered some Neosporin on it and used butterfly bandages. But it split in a crescent shape, like someone had jammed a thumbnail right into his chin. So to the brand-new ER we go. Fine young gent suggested I bring our read-aloud, The Blue Fairy Book. Having a read-aloud in the emergency room for all of the waiting sure made the time pass quickly, but here's a tip: Stories like "Bluebeard" and "Trusty John", not good emergency room reading. There's blood practically dripping from the pages. And we're not faint-of-heart. Red-Riding Hood gets eaten. Sometimes the good guy dies of a broken heart or doesn't win. But "Trusty John" was so bloody that I summarized the end instead of reading it out loud. Bleah. The stitches part was quick and easy. The doctor decided to put one stitch in, then added another once the actual stitching started. She and the nurse actually made the experience fun for our brave young gent. They admired his cowboy boots, laughed at his jokes, and voted him Bravest Patient of the Night. It was interesting: When youngest gent got his stitches, he had a male nurse and a male doctor. The process of getting stitches was very straightforward and business-like. This time, my fine young gent had a female nurse and female doctor. It was a very collaborative process, with suggestions and "What if we use the new....thingie, the squeeze one?" and "Do you think we could...?" Too small a sample to tell if it was a personality or a gender issue, but fun to see the contrast nonetheless. In Stitches, Part I (Levi's stitches) and Levi's stitches picture.